Miles of white sandy beaches surrounded by tropical forests. Breathtaking mountain peaks. Airy clouds and a silver moon lighting up the endless blue sky. The wedding ceremony accompanied by the sounds of the ocean... It seems that in the Dominican Republic, love reigns everywhere. The second largest country in the Caribbean is the perfect spot for a ceremony of uniting two souls, honeymoon, or a romantic trip, and here’s why. Pure coastal line with pristine white beaches attracts newlyweds, while upscale hotels and resorts offer everything necessary for a celebration. An important fact determining the choice of this country for a wedding is the presence of eight international airports located near major resorts and cities. Moreover, this country is officially among the best destinations for weddings. Planning a ceremony in this beautiful country is few-steps easy. Many hotels that offer the all-inclusive plan provide a wedding package, including a free ceremony coordinator. All you need is to send the necessary documents to the Dominican consulate in advance for translation and legalization, adding an empty envelope with the stamp and your address. The majority of hotel complexes, from luxurious resorts to small cozy boutique hotels, provide a variety of services for organizing and conducting wedding ceremonies to ensure that the newlyweds don’t get distracted by annoying details. Travel agencies provide detailed advice, contacting the hotel you choose for the wedding beforehand. 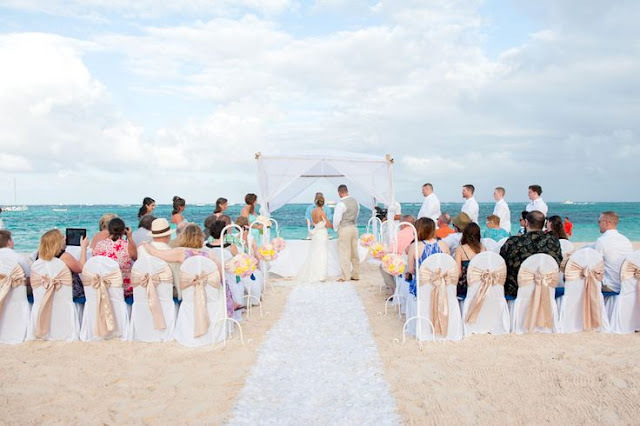 Ceremonies can take place both in the solemn atmosphere of the historic churches and in the romantic setting of the beautiful beaches of Puerto Plata, Samana, Punta Cana, La Romana, Juan Dolio or Boca Chica. You can adjust the program of the holiday to your taste, both with traditional and a very exotic entertainment, like horseback riding or yacht voyage, quad biking, golfing, or swimming with dolphins. Music accompaniment, solemn decoration of the hall, a bridal bouquet, and the groom’s attire are also individually selected. Besides, you can hire a photographer to capture every moment of the event. Additional services include spa treatments for two, facial and body care, rooms for newlyweds, a romantic photo session, a wedding cake, as well as planning a banquet, entertaining events for guests, and much more to make the wedding day unforgettable. Specialists will also take over preparations of all necessary documents and verify the correctness of official papers issued after the ceremony. It’s worth considering that while basic requirements for all couples are the same, the process may differ depending on the law and religion. Organizers will help you select an authorized representative of the church or civil institutions and send all the finished papers and certificates. As a rule, offers with an official wedding ceremony cost from $900, and a ceremony with the vow renewals costs from $300 to $400. The ceremony itself is conducted in Spanish, but the organizers will provide you with an interpreter if needed. Some resorts allow you to hold an unofficial wedding ceremony. According to tour operators, wedding travel represents almost a third of all tours to the Dominican Republic. The main advantage of this diamond of the Caribbean is that the weather here is always perfect, and once you decided to get married, you don’t necessarily wait for summer.